February 11th, 2010 by KTU | Filed under 5. Exterior Materials and Finishes. The exterior finish palette for my house is black/graphite aluminum windows, gray barnboard, and oxidized (i.e., rusted) cold-rolled steel. 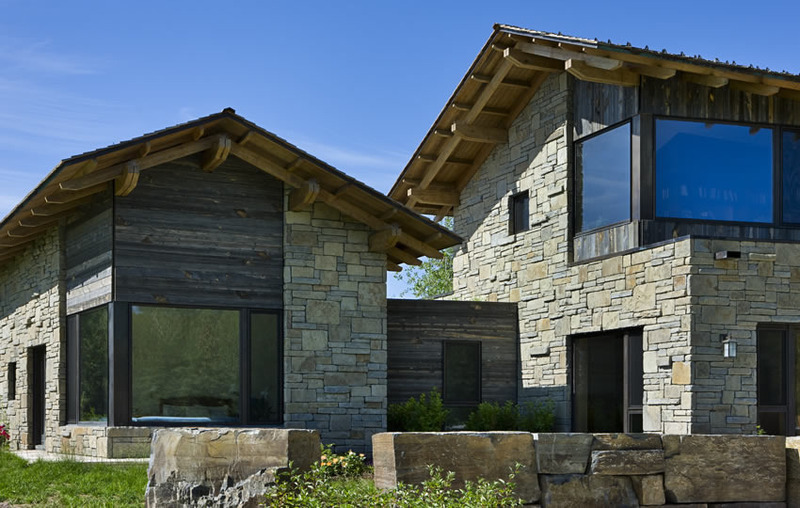 This house, by CLB Architects, basically has the same palette, except that I believe this siding is virgin cedar treated with Lifetime wood treatment. Palette of black windows, vertical weathered siding, and oxidized cold-rolled steel. 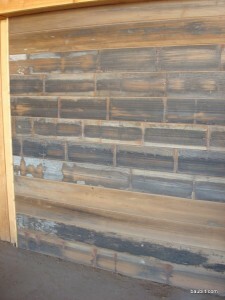 I hope to achieve more of a gray weathered look on the vertical siding, probably by using reclaimed barnboard. This house, although it is mostly faced in stone, has some nice gray barnboard as well. 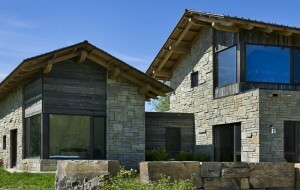 John Dodge Compound (CLB Architects) with some gray reclaimed barnboard. 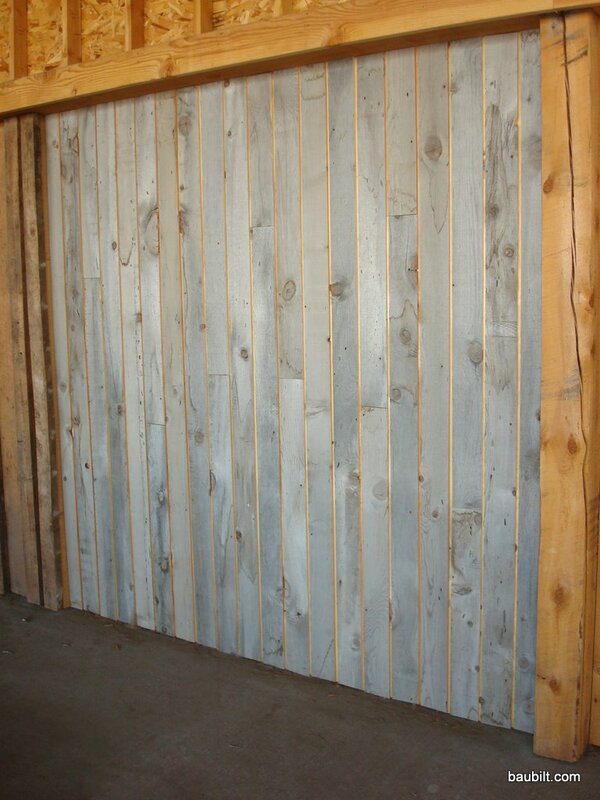 If you want gray barnboard, the dilemma is whether or not to pay almost double to have your material “pre-weathered” by a 50-year-old barn or to just put up virgin douglas fir and let nature do the weathering over the next decade or so. I admit that paying double for reclaimed material is a pretty wacky post-modern kind of indulgence. We humans are strange creatures. 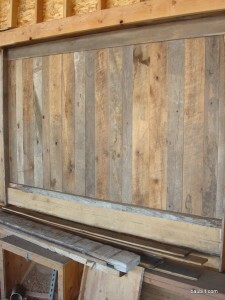 Trestlewood is an excellent supplier of reclaimed materials in the Rocky Mountain West. I spent an hour or so with the owner Bob Cannon at their facility in Blackfoot, Idaho. They have a useful display of siding options. Here are my photos. This is coverboard, so named because it might be from boards used to cover lumber in an outdoor lumber yard. 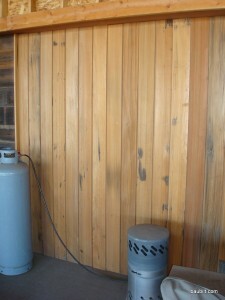 However, most of it is just pine or fir laid out to weather in the sun. 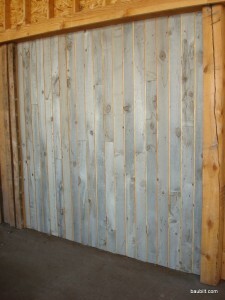 This is the gray vertical barnboard I think I'll use. Really, really nice planed cypress picklewood. Picklewood is made from the staves from vats used in pickle processing plants. This is skip-planed redwood picklewood. I love this stuff. Too bad it is horrifyingly expensive. 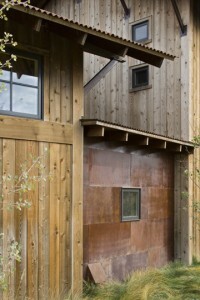 See how the marks from the steel bands around the pickle vats give a kind of shingle look to the horizontal siding. 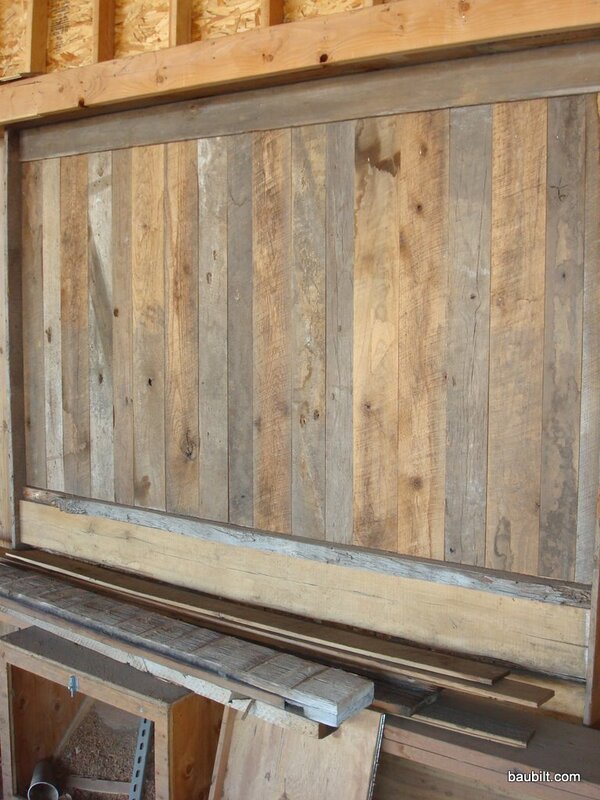 For the weathered barnwood…did you treat it in any way. I’m working on a house right now that I want to use barnwood siding on and I would like to treat the wood but don’t want to change the look. I think this depends on your climate. If you are in a dry climate I would not do anything to the barnwood. I examined some 100-year-old mining shacks on the slopes near my house in Utah and the untreated douglas fir is quite sound, even with full exposure to the weather. On the other hand, pine left untreated and exposed in Vermont can rot. Although, note that much of the reclaimed barnwood comes from midwestern and eastern structures, and has lasted several decades. I am also doubtful that a “clear” coating can provide much weather protection. The painters will tell you otherwise, but I just don’t think anyone has shown that an unobtrusive coating does much, other than possibly providing a little UV protection. If you are in a wet climate, I would use one or more of the following approaches: install the siding over a drainage layer like Wrapshield HS (to ensure drying), install western red cedar and just let it weather on its own, or install pine/spruce/fir siding and pre-stain both sides. 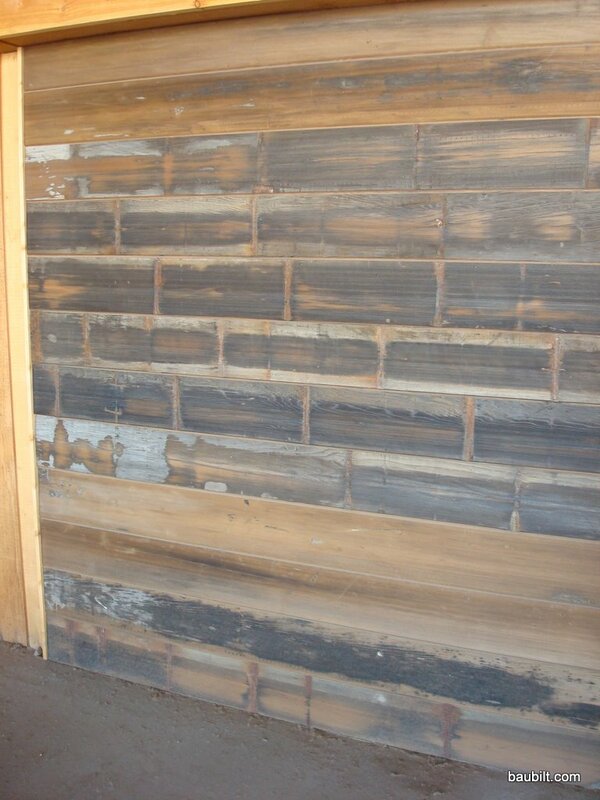 I suspect that even in a fairly wet climate, barnwood over Wrapshield HS would last 30+ years with no coatings.